Feedback: 39 comments - leave yours! 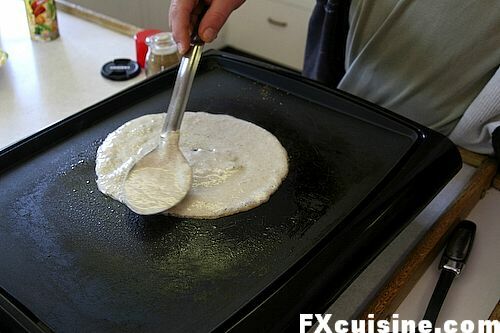 Rick makes giant Indian savory pancakes on the towboat he steers through the Snake River system. For a year now I've been exchanging emails with Rick Oppegaard, a keen reader of FXcuisine.com who tried many of the recipes on this site. Rick, a seasoned home chef, cooks from a most unusual location. He is a boat captain in the US Pacific Northwest. In his off watch time, he enjoys taking the boat's fare way beyond the steak and potatoes most of his colleague eat. 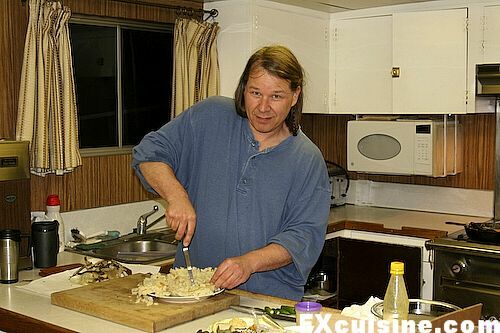 Rick kindly took many photographs of his daily life on the boat and some of his cooking. Today, he shows us how he makes his engine room dosas. Dosas are giant paper-thin pancakes from the South of India. They are made from a fermented rice and lentils batter. 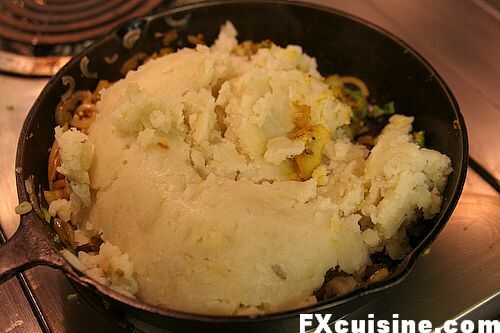 I pass for a fearless cook but never dared tackle this most difficult Indian recipe. But Rick makes them every day on his boat - let's see how. Basic Dosa batter is made from 2 parts Basmati, 1 part urad dal (picture). Soak rice and dal for four to six hours. Drain and wash well. 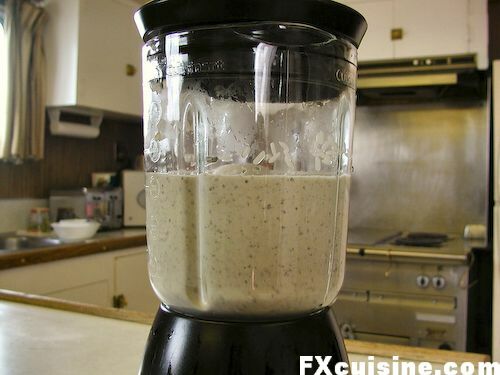 Put rice in blender with a bit of liquid and blend for 10 min. or so. You want it to blend easily, but not be too thin. When finished do the same with the dal. 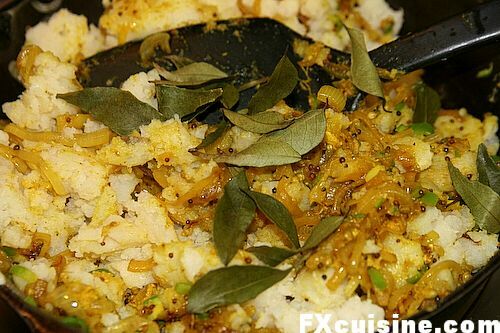 Combine the rice and dal in a bowl and let ferment overnight. The hard part for us in cold climates is that it requires heat to properly rise. You can put it in an oven on the lowest setting overnight, or do like I do, and put in in the engine room! ... where it is around 90 degrees in the winter, and well above 100 in the summer, the batter raises quite well. Those are EMD diesel engines, each rated at 1500 horsepower. There are two for a total of 3000 HP. Add curry leaves. Cook and stir until well mixed. Heat griddle. Add a tsp. or so ghee to griddle and sprinkle garam masala on hot griddle. Spread the batter as thin as you can. A special wooden device and a runny batter will help you get even thinner dosas - if your have large enough plates to serve them. The trick is to spoon half a cup or so on the griddle, using the flat part of the spoon to spread the batter out in a circular pattern, as thin as possible, Rick explains. 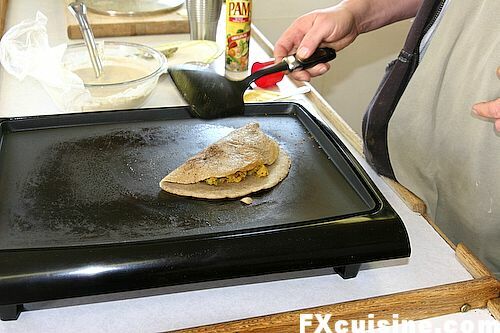 Rick helps the crêpe cook on both sides by covering it with a pot lid. Spread the filling on one half. Sophisticated, authentic homecooking in the dead of night in the middle of the Snake River. Is not life about this? Another day I will show you more about the daily life on the boat and what the crew eats when Rick's not cooking. This unusual curry turns bland watermelons into a spectacular and quickly prepared original and authentic Indian curry. Edible sterling silver foil decorates Indian food at weddings. 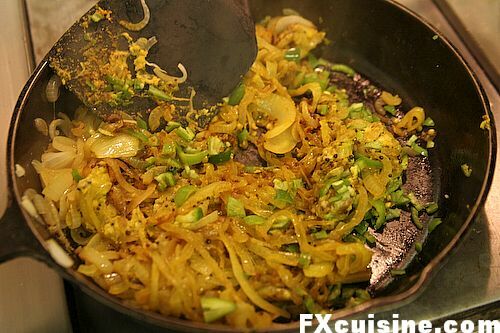 Here is how they make it in Lucknow and how you can use it on a leg of lamb to eat like a Nawab. Dosas are indeed from South India but it's a generic name for pancakes. There are variations such as Appam from Kerala, rice dosa, semolina dosa, ragi (finger millet) dosa, wheat dosa, etc. Dosas are mostly made in the states of Karnataka and Tamil Nadu, with variations in both states and in neighbouring states. Dosas can be as big or as small as you like and as thick as you like or paper-thin. Dosas in Karnataka tend to be thicker while those in Tamil Nadu tend to the opposite. Dosas in North India tend be thin too but otherwise resemble dosas from Karnataka since most of the dosa cooks in restaurants tend to come from Karnataka. Typically, dosas are about the size of a dinner plate. The enormous ones you see in restaurants are just for show! There are notable differences in both taste and texture of dosas in Karnataka and those of Tamil Nadu - those in Karnatake tend to be fluffier (noticeable even when quite thin) than those from TN. The difference in taste is something I'm not able to describe unfortunately but I think it has to do with the addition of Fenugreek seeds in the Karnataka version. Rick's recipe appears to be the one from Tamil Nadu. He doesn't use fenugreek seeds and the batter seems not to be as bubbly as the one from Karnataka. Also, basmati rice is a no-no for dosa for two reasons : lack of starch content and overly strong flavour (it's not grown in South India so it's not used in dosa batter). A short grain rice is better suited. Traditionally, a stone mill is used to grind the batter since it gives the smoothest batter, but a mixer/blender is ok too. As to spreading the batter, "spiral" is better term than "circular". The way we do it is to pour the batter in the centre of a seasoned but not oiled gridle and use the back of the ladle (something like a soup ladle but with a fairly flat bottom) to spread it in a spiral motion taking care not to do multiple passes to avoid flattening the air bubbles. 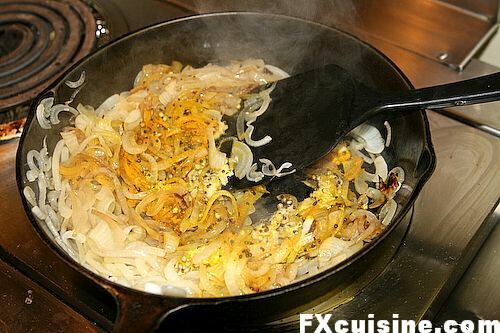 Once the batter is spread, pour a teaspoon or so of vegetable oil or ghee. It's the oil from the previous dosa that's used to lubricate the gridle for the subsequent one as pouring batter on a oiled gridle won't let it stick properly to the gridle. Once the dosa is done, any accompaniment to your taste works! I apologise for the lengthy explanations and comments but I felt it was necessary. By the way, for those interested, an electrically powered stone mill to make batter is available in many Indian shops that sell kitchen appliances. 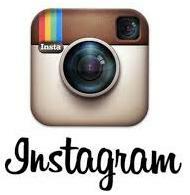 I am Indian and really love your site, especially for those extra special photographs. I feel ashamed of myself being an Indian and not made a masala dosa so far just because I am so damn crazy about spending less time in the kitchen. But just liked the way Rick did it. Hi FX, just wondering for the fermentation do you have to add anything to the mixture, like yeast or starter? Oh. My. Garsh! Thank you for posting an excellent series. 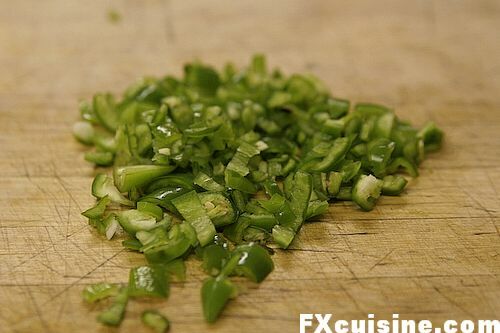 Thanks to Rick for taking us through each step, FXCuisine-style! Thanks also to Vikram for that very informative post. I have a question though: if basmati is a no-no, can I use any old short-grain rice like the CalRose I can get here in San Jose? Or does it have to be a short-grain rice from India? First, I want to say, publicly, thanks to Francois not only for including this article, but for all the work he does to make this place such a joy to visit, read and salivate over. His pictures are fantastic, his writing style entertaining and witty and his recipes sublime. He inspires me. Thanks for all the comments so far, and a special thanks goes to Vikram for his great post with more information about Dosas. I have never eaten a Dosa cooked by an Indian, as most restaurants in my part of the world cook north Indian cuisine. I ran across the recipe in a cookbook my mother bought for me while she was visiting Calcutta, back in the 1980's. 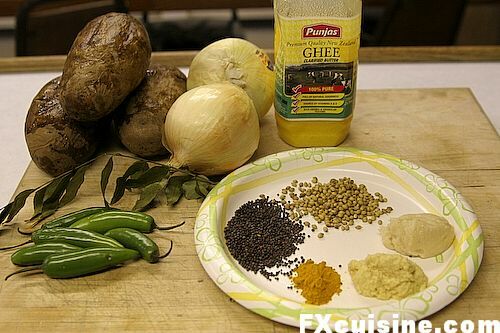 For many years I wanted to cook Indian food, but had no access to the spices needed to properly prepare the recipes. It has been my good luck that many Indians have immigrated to my town and there are now several places to buy spices and supplies. So, thanks Vikram, for the hint about using fenugreek, and about using a spiral motion to spread the batter. The tip about using a rice other than Basmati is one I will pay attention to. 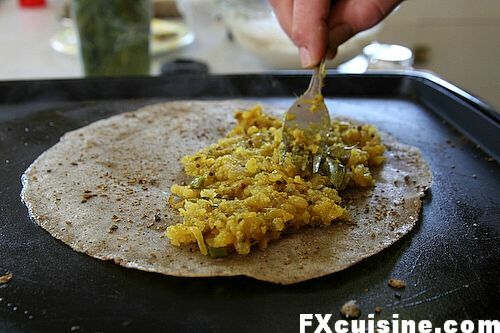 I do know that using ghee to cook the dosas are the traditional way to cook them, but for the last year I have been on a quest to lose weight, so I look for lower calorie ways to cook my food. I use a bit of ghee, but mostly use a non-stick spray. I know some may think it is blasphemy to use lower fat methods to cook but I have lost (so far!) 65 pounds using my methods, while still enjoying delicious curries, dosas, chutneys and chapatis almost every day. To Taz, who asked about fermenting. I don't know what does it, but the recipes I've used call for just rice and dal. Perhaps adding the fenugreek seeds as Vikram suggested would make it rise even more. I do know that the warmer the batter is kept while rising, the better it rises. here are some more information and clarifications that I got from my personal expert on Dosas - my mother. 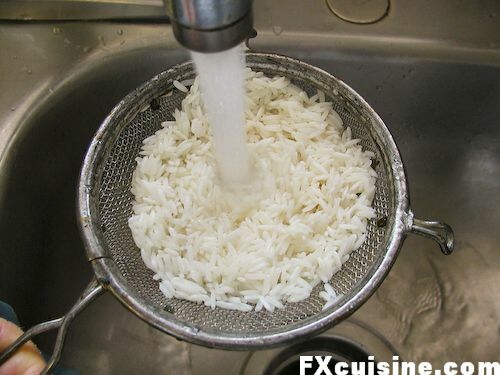 Rice : The best rice to use is a short grain parboiled rice but a normal short grain rice will do too. My mother's recipe : 2 cups of rice, 1/2 cup of urad dal (lentils), 1 to 2 teaspoons of fenugreek seeds. 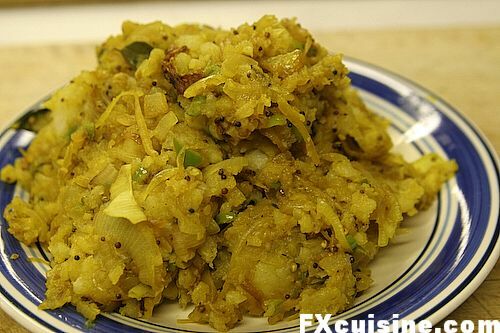 My mother also adds pressed rice (flakes) called Poha or Avalakki, substituting about a half cup of rice. This makes the batter fluffier. Soak all the ingredients for 4 - 6 hours and grind. Add salt and let sit overnight. 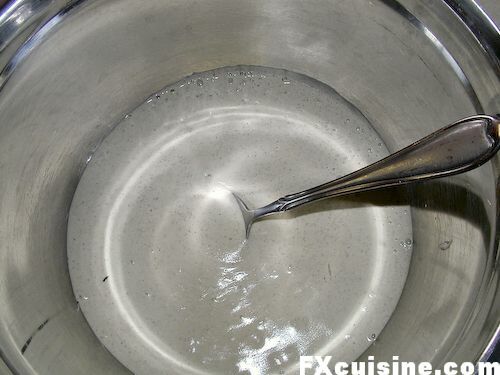 After the batter has risen, mix thoroughly but do not beat it, to dissolve the salt. Typically, the first dosa on a lightly oiled gridle will be sacrificial dosa as the oil pooled on the gridle will prevent the batter from adhering to the gridle and therefore cook evenly. The next dosa should not need any pre-oiling of the gridle. my experience cooking dosas tells me that on a well seasoned gridle, only the bare minimum of oil is needed to retain the "non-stick" seasoning of the gridle. Usually about a half teaspoon. But the flavour and aroma that ghee, butter or even sesame oil bring to the party is extraordinary. So I usually use a bit. The fermentation is due only to the lentils (urad dal). I'm not sure of the mechanism of fermentation but I do know that lentils contain a lot of protein. So I presume some enzyme in the lentils starts the process. A dish called urad dal vada, a savoury doughnut, is composed of only a fermented urad dal batter with some spices. The high protein content ensures that they don't disintegrate when fried. I'm not familiar with the types of rice available in the US. 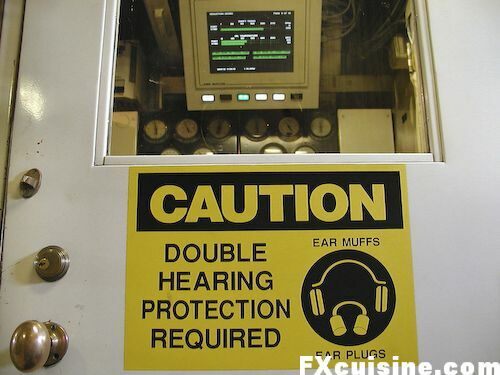 But I think you could try using any type that meets the requirements. If you aren't sure, you could experiment with small quantities of different types to find the one that gives the fluffiest results. I hope this answeres some of the questions. Happy cooking! Great pics and write-up, Rick! Indian mamaks (coffeeshops) in Malaysia serve dosas all the time. (Here its called thosai)They make a runnier batter and spread it thinner than yours, resulting in a very crisp pancake when eaten fresh, but not as nice when bought as takeaways. Masala dosas are my favorite! I've never seen them served folded over like yours; here they're either rolled in a sort of flattened tube or folded into a triangle. They're even better when the potato filling has some chunks in! Another great and simple dosa is called thosai bawang here. 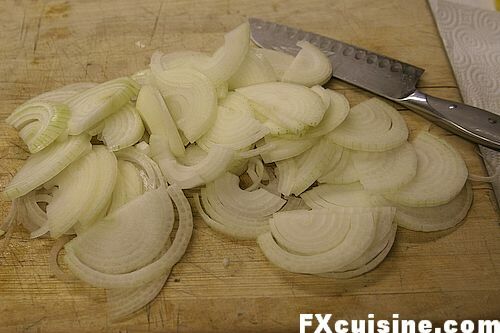 Basically, onion slices and some green chilli mixed into the thosai batter before frying. Rick, I second Shu that with such a huge rectangular frying pan you should try to make one of these paper-thin, newspaper-sized dosas. Runny batter and a small T-shaped tool to quickly spread the batter before it sets and you're on your way to Texas-size dosas! Vikram, thanks for calling your mother and share her dosa tips, very accurate and comprehensive! Us Westerners should lay down our books and fly to India to learn Indian cuisine in an Indian home! we knw it as masala thosai in malaysia...my fav breakfast item! The way I see them make it is they have a small wooden or steel bowl where they would ladle a portion of the batter onto the pan, and quickly use the bottom of the same bowl to spread it in an outward moving circular motion. The result is an even round pancake with beautiful concentric lines in it. Looks easy but I think it takes a lot of practice! I saw that great photo of Mt. Hood at the top of this posting and thought "Wow, that picture was taken less than an hour from my home. FX is blogging about my backyard..."
Great post and it goes to show that in the most unlikely of places, you can find creative and unique individuals who are living life outside of what you might otherwise assume to be a fairly rigid box. Farmer de Ville, thanks for your comment! Indeed Rick is a very unique person and fearless home chef, after the long days he works you'd think he'd just hit for the bunks, but no, he takes on some of the most difficult dishes in Indian dishes and emerges with flying colors! I read Shu's post about Thosai Bawang with great interest. I decided to try it. I added chopped onions, chopped jalapenos and chopped tomatoes to some dosa batter and fried them in ghee. Put them on the plate with some Mango Chutney. Delicious! Thanks Shu, for the good idea! Never mind the fermenting, cooking rice without a rice cooker is the part that looks the hardest to me. Rick sounds like a cook who plans ahead. I'd imagine running out of ghee or some other ingredient right in the middle of the river isn't going to be like running out of ingredients on land. Regarding Indian pancakes, dosa (or dosai as it was first introduced to me) is one of those really interesting words. It is spelled slightly different in the different Indic languages. I was about half way into the post before I realized dosa and dosai are the same thing, and both were spelled correctly. Also, for some reason when I think of large Indian pancakes, the first thing that comes to mind is actually another type of crêpe that is called paratha. More specificaally, I like the variation that is round, thin multi-layered version that is made much much larger than this and folded into itself repeatedly to keep the dough size manageable. As for masala, I think of masala as a type of sauce. First thing that springs to mind is the butter chicken masala. Mmmmm! Oh the wonders of free association. Now I need to go find myself a snack. Preferably something Indian. Roti Paratha (or pratha in Singapore; canai in Malaysia) is very popular as breakfast and supper items. Very greasy though. There are so many variants of the basic paratha. With onions (bawang), palm oil margarine (planta), folded really thick with planta and sugar (bom), egg (telur), non-folded with sugar (tissue), with canned sardines, cheese, and even milo and bananas just to name a few. I've been to mamaks with 30 over types of paratha on the menu! If we're talking about large thin Indian crepes, check out this thing called Apam... Huge! Helena is so right about recipe planning on a towboat. I usually take with me: blender, food processor, a chef's knife, tortilla press, and a spice grinder. Also, a large assortment of spices for Indian and Mexican cooking. 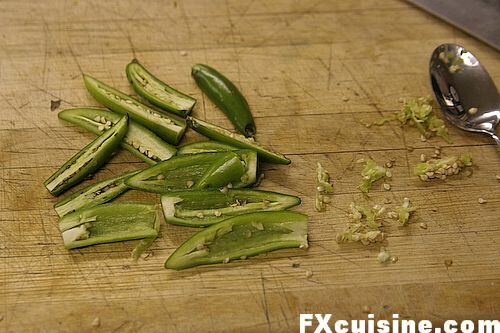 Six or eight different types of dried chilies....the list goes on. The company is very generous with out food allowance. We can get just about anything we need to cook tasty treats. But, when one runs low on something, it is not a matter of wandering up to the market to replace it! I'm a die-hard dosa fan and I immediately tried out Rick's recipe. The result? 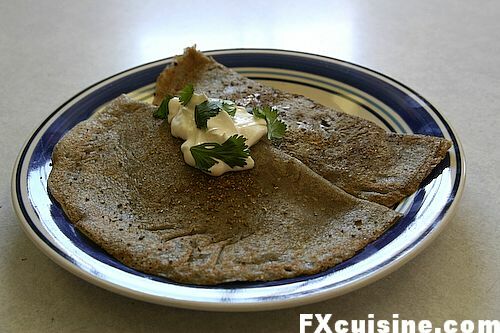 Fabulous, crepe-thin dosas - Also made them soft and silky. I've tried all kinds of dosa batter combos and this is one of the best. Great, Rick! Excellent post! Can't wait to see what else you bring to us from Rick's kitchen. Cynthia, next stop with Rick will be a grand tour of his boat and the regular fare of his crew! I can't believe how simple this looks. I love the large freshly-made masala dosas a local place makes. They serve them gratis with your meal. I hesitated to try to make them (what with fermentation and all) but now that I have the pictorial step-by-step, by golly, I think I can, I think I can! Thanks FX and thanks Rick. And ditto finding adventurous and knowledgeable and interesting folks on the web. It's soul-satisfying. - a warm cable modem or router is the perfect place to rest a metal bowl with the fermenting mass. Insulating the top of the bowl with a tea towel or similar also helps. Gina, good luck with your first dosa! Lovely photo essay, the most unusual setting for a nice, homey authentic dosa. It is part of my native cuisine: I'm a Tamil Indian. Light and nutritious breakfast or snack ( called "tiffin" in Indian English). The mixing with the dal actually lowers the otherwise ruinously high glycemic index of polished rice, and adds protein, and the bit of fenugreek helps kick-start fermentation. Modern Indian homes often use brown rice and non-stick pans. Sesame oil is a must for the right taste. Thanks again FX. Parshu, thanks for your visit and learned comments, I need to try this once but don't have a nearly large enough pan! I like the way you make that dosa....if you have time the please come to my home and make me one coz I dont know how to make them. 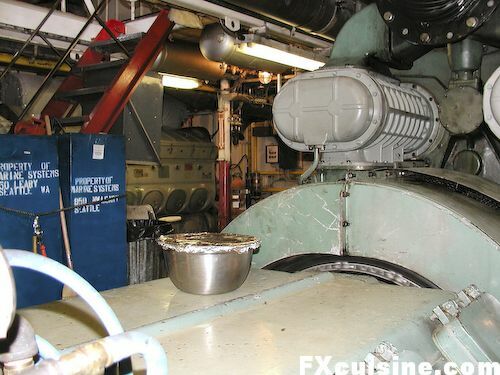 When I was in the Canadian Navy, many different older sailors shared stories of food cooked in the Engine Room, especially spiced potatoes. However this tradition stopped when they retired "old steamers" in the 90's. FX's answer→ Did they place their dishes on the firebox to cook them? What a great site!I couldn't believe that Rick ,who has never eaten in south Indian restaurant could flip around such a wonderful Dosa.Thanx FX for reaching this amazing story to us.I love cooking but now i am more inspired!I am so envious of Rick of his exotic cooking location-engine room! I know i am 7 months late to comment on this article but can't help posting it.I would also like to add one more tip from my experience. Now a days i use Brown Basmati Rice to make dosas.It tastes delicious,looks same as regular dosa as a properly roasted Dosa looks little golden brown.No one can make out the differance & it helps to overcome the guilt feeling of eating lot of carbs (asuming the health benefits of brown rice)!Only when you grind the rice & dal, the batter,the batter looks brown!So what?only the end result that is delicious dosa matters.Sorry Vikram,i read your earlier post so let me tell you in advance, i haven't tried making Dosa with parboiled brown rice(i don't even know if it exists!) Though here in dallas we have various kinds of rice available due to huge south Indian population. 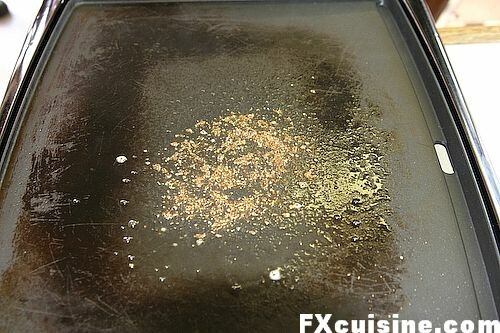 FX's answer→ Thanks, I sure hope Rick continues to cook the way he does in this article! La masa básica de Dosas se hace con 2 partes de arroz Basmati por 1 parte de urad dal. Remojar el arroz y las dal de cuatro a seis horas. Escurra y lave bien. Poner el arroz en la licuadora con un poco de líquido y mezclarlo durante 10 min. más o menos. Usted quiere que se integre con facilidad, pero no que sea demasiado fina. Cuando termine, hacer lo mismo con las lentejas. Junte el arroz y las dal en un bol y dejar fermentar durante la noche. La parte difícil para nosotros en los climas fríos es que requiere calor para que después se expanda correctamente. Usted puede ponerlo en un horno en la posición más baja durante la noche, o hacer como yo, y ponerlo en la sala de máquinas! Yo inicialmente tuvo dificultades para conseguir que mi masa de dosas subiera, pero encontré que cuando lo puse en la sala de máquinas, donde hay alrededor de 90 grados en el invierno, y muy por encima de 100 en el verano, la masa se cocina bien. Esos son los motores diesel EMD, clasificación según el grado a 1500 caballos de fuerza. Quite las semillas y corte los chiles. Añada el puré de patatas. Añada las hojas de curry. Cocine y revuelva hasta que esté bien mezclado todo. Calentar la plancha. Añada una cucharadita más o menos de ghee sobre la plancha y espolvorear garam masala sobre la plancha caliente. Extender la mezcla lo más fina posible. Un dispositivo especial de madera y una masa liquida le ayudará a conseguir dosas aún más delgadas - si se cuentan con suficientes grandes placas para atenderlos. Rick explica que el truco está en echar media taza o menos en la plancha, y con la parte plana de la cuchara extender la masa en un patrón circular, lo más fina posible. Rick ayuda a cocinarse la crêpe por ambos lados, cubriendola con una tapa de la olla. Extienda el relleno en una mitad de la dosa. Doble la Dosa sobre el relleno y continúe cocinando hasta que se doren por ambos lados, adornar con yogurt y cilantro y servir! Sofisticada, comida casera auténtica en medio de la noche y en medio del río Snake. ¿No es la vida esto? Otro día mostraré más sobre la vida cotidiana en el barco y lo que come la tripulación cuando Rick no está cocinando. Great recipe. I am looking forward to trying it. Found this blog on StumbleUpon, and I just wanted to say that I appreciated the info! Anyone tried a morsye mylari dosay? 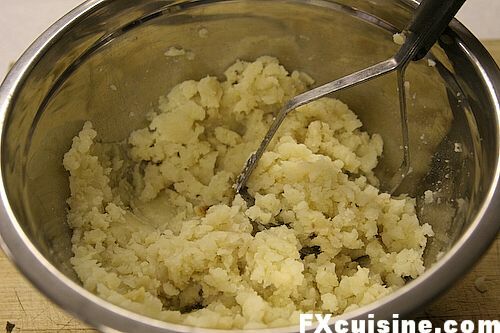 It's a very soft vareity (I believe they add extra "avalakki/poha") and it melts in the mouth. I haven't seen this vareity served anywhere else in India (or outside for that matter).